Historian Charles Freeman talks us through his last three books that deal with Paganism, heretics, the early Christian Church, Greek philosophy and the "Swansong of Free Speech". "Did an authoritarian and politicised early Christian church put paid to the Pagan tradition of Reason, debate and tolerance?". In 1990 *Charles Freeman* was appointed Chief Writer on a twelve-volume history of the world. The project collapsed three years later but he was able to rewrite the early volumes as “Egypt, Greece and Rome, Civilizations of the Ancient Mediterranean”, Oxford University Press, second edition, 2004. He has followed this up with “The Greek Achievement”(Penguin 1999), “The Legacy of Ancient Egypt” (Facts on File, 1997) and “The Closing of the Western Mind”, a study of the relationship between Greek philosophy and Christianity in the fourth century and beyond. His “The Horses of St. Mark’s” (Little Brown, 2004) is a study of these famous works of art in their historical contexts over the centuries. 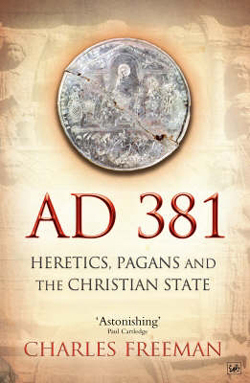 His “AD 381, Heretics, Pagans and the Christian State” was been published in the UK by Pimlico in 2008 (US edition, Overlook Press, January 2009) in which he argues that the year 381, when the emperor Theodosius imposed Christianity on the empire, is a neglected turning point in the history of European thought. 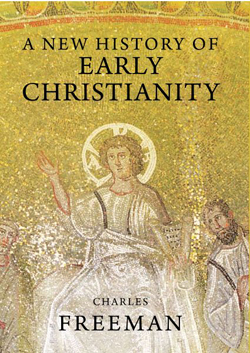 His “A New History of Early Christianity” has just been published by Yale University Press (September 2009). It was named as one of the ‘Non-Fiction Books of the Year’ by the Scotsman newspaper. His study of relics in the medieval world also for Yale will be published shortly. A future project is a comparative study of the Greek intellectual achievements with those of the Renaissance/Reformation/ Enlightenment period. 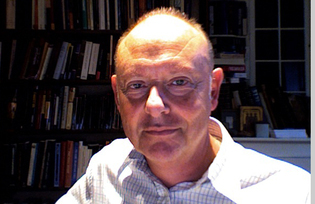 In 2005 Charles was appointed to the Editorial Board of the Blue Guides as Historical Consultant and he has written the historical introductions to several volumes of the new editions, including Rome, Florence, Venice and Mainland Greece. He is also the author of “The Blue Guide Sites of Antiquity, Fifty Sites that Explain the Classical World” (Somerset Books, 2009) which has been widely praised (see the review in Minerva for January, 2010). In 2003, Charles Freeman was elected a Fellow of the Royal Society of Arts. You work as a freelance historian, is that correct? Yes, I have been freelance since 1988. I enjoy the control over my own life, although one risks being in a somewhat twilight zone so far as tenured academics are concerned. And you also conduct private tours and write for the Blue Guides? Yes, I have done some ten tours of Italy, mostly drawing participants from a list of contacts (but will also design a tour if approached – I did one to Rome for a cultural group, for instance) and I do tours of Classical Greece and Turkey for a firm called Ciceroni. Where did your interest for Antiquity begin? Probably when I was nine. I vividly remember climbing up to the Roman fort on Wardlaw Hill, in Dumfriesshire in Scotland with my mother. You initially studied Law, is that correct, but spent a great deal of time at archaeological digs? Yes, my father thought I ought to have a Law degree for long term financial reasons! But I did manage to fit in a lot of archaeology around it. I have dug in Britain, Italy, Turkey and the Sudan. I never practised although I did re-sit my law exams when I was forty and had a job as a solicitor lined up – but then the project below came along and it was money upfront! When did you start to specialise your studies in Antiquity? The first major commission I got that involved the ancient world was when I was appointed Chief Writer on a twelve-volume History of the World and we started with the volumes on Egypt, Greece and Rome. I worked with some top academics on the text and when the project collapsed three years in (for financial reasons), one of them recommended Oxford University Press to take a rewritten single volume. It was well reviewed and is widely used in US colleges – this gained me a solid reputation. You mention in one of your introductions that your initial intention was to write about Hellenism. How did your initial interest in Hellenism develop? I first travelled to Greece in 1967 and spent an extended period of three months travelling there in 1970 and then had further trips. I came into Greek philosophy in a big way when I was working on the International Baccalaureate course on critical thinking and it helped to know about the different approaches to philosophy the Greeks took. I find Greek thought in general intellectually exciting. I wanted to look at your three latest books together: “The Closing of the Western Mind”; “AD 381” and “A New History of Early Christianity” as they appear to have a common thread. Is there in fact a common theme or thread linking them? The first two are closely linked, in that the second clarifies some of the issues in “The Closing of the Western Mind” by focussing on one important transition year. I was approached by Yale to take on “A New History of Early Christianity” and, at first, was reluctant to do so ( the first century material is very difficult to handle well ) but I am glad I was able to weave some of the themes from the earlier books into a wider perspective. I was able to stress (against traditionalists) the diversity of early Christianity and especially the problems of imposing any kind of theological unity without political support. How was “The Closing of the Western Mind” received by your fellow historians? Quite a number dismissed it, but very few of them took on its central argument. I have found it sniped at in a number of books but there is often little evidence that the critics have read it. One reason for writing “AD 381” was to highlight the arguments that I felt critics had to address. Overall “AD 381” was not nearly so widely reviewed as “Closing” and my critics appear to have ignored it. What were the main conclusions that you drew from your research into this period? The most important is that the history of the fourth and fifth centuries, and of early Christianity in general, needs to be rewritten. I would stress that the quality of Greek intellectual thought and education remained very high into the fourth century, not least among theologians who used sophisticated methods to discuss the issues. The clamp-down by Theodosius in 381 was much more effective than most historians suggest. Most theologians refuse to accept that the Nicene alternative was anything else but the obvious and only ‘solution’ to the problem of the relationship between Father and Son, but a study of the facts and the debates of the period cannot support this view at all. Were you perceived as being somewhat anti-Christian or anti-Church by some of your readers? Have you become an unwilling champion of atheism despite your best efforts? Yes, I have got caught up, against my will, in these Christianity versus atheist wars. I would like to think that my concentration on the evidence puts me aside from these battles that often take place from long-established embattlements. The debates are often sterile. There is a longstanding one over whether Christians burned down the library in Alexandria. Probably not, but books may have been destroyed during the destruction of the shrine of the Serapeion in 391. However, this is no longer a relevant example. We have hagiographical accounts by Christians boasting their credentials in which the destruction of pagan statues and books are included, we have legislation that talks of burning of books and the archaeological evidence of destruction of shrines by Christians becomes more extensive year by year. So to become fixated on what happened or failed to happen to the library of Alexandria is misguided. There is simply a lot of evidence for Christian destruction of pagan symbols, temples and anything associated with them. Do you see Greek culture as representing the highest point in human civilisation which was then brought to an end by the stifling of free speech by both the Roman Empire and the early Church fathers? Well ‘highest point’ would be going too far. There was a diverse and vibrant intellectual culture in ancient Greece that persisted at a high level into the fourth century (and which also helped raise the standard of theological debate – I would say to a higher level than it is today!). The empire faced immense challenges and intellectual life would probably have stagnated at some point. What I was not aware of until I did the research for “Closing” was how much evidence there is of outright repression and how much specific rejection of the empirical tradition of Aristotle. Your book AD 381 looks at a defining moment in history, does it not? Yes, this does seem to mark a turning point of immense significance, bexause it defined, through law, that there was something called ‘the truth’ that had to be defended against ‘heretics’ – even though the philosophical base on which this ‘truth’ was erected was totally inadequate. It is clear that theologians had immense difficulties, and still have, in finding a rational basis for the doctrine of the Trinity. Your book “381 AD” pinpoints a specific moment in world history which imposed one version of the Christian faith on the whole empire. Why did the Emperor Theodosius bother to impose Christianity with such rigour? What led him to take on such a massive struggle, especially when the creed he was imposing was still so badly thought out. He was in a desperate position, an outsider who had come to the Greek east to sort out an empire on the verge of collapse. He was a devout Christian and he also felt that religion could be used in the service of the state. His own background, aristocratic Spanish, was Nicene and he must have also realised that this was more attuned to an authoritarian empire (dehumanise Christ the rebel by making him a full-scale divinity) He was clearly disturbed by the intense debates among Christians – remember the bishops were powerful figures in the city communities by then – and he felt that imposing one uniform doctrine might help bring social as well as religious order. Would you say that you harbour a sense of nostalgia for pre-Christian Greek culture, seeing the Christian attempts at intellectual rigour as a bit childish and altogether unfortunate? Is that unfair or indeed inaccurate? It is not so much nostalgia as a belief that theological certainty is impossible to obtain – how do you get agreed doctrines from the very varied scriptures, philosophy, reason ,etc. The idea that you could find certainty in these areas degraded intellectual life. Even today much of theology is completely separate from wider intellectual currents – it just doesn’t connect. I was interested by your insistence that Christian values should be seen in their historical context as Christian values do vary according to which ones are at the forefront of current dogma. What led you to take this “relativist” view? Basically the evidence. One transition that I have come across in my recent work on medieval relic cults is a transition in the eleventh century from Christ being seen as a warrior god to Christ as a judge who will inflict punishment on sinners. Both have little to do with the gospels but they show how Christ became an icon into which different needs at different times were fed. You talk about some of the backroom negotiations behind the fighting over Christian dogma and suggest that much of the fighting was about access to tax breaks and government jobs within the empire. At times the Early Church seems very worldly. The endless debates about creeds and dogma went on for centuries but to what extent was all this intellectual activity just a manoeuvring in the struggle for worldly power, in gaining imperial support? There are some cases where Christians did appear to adopt a theological stance for advantage but I don’t think this was predominant. Essentially the debates went on because there was no philosophical way of resolving them. Maths can be proved , science can be ‘proved’ by the accumulation of evidence (while always subject to falsification), theological issues cannot be proved either one way or the other . This does not mean that debate is bad, as it does help clarify what the issues are and where some views are misguided. What it can’t achieve is truth in the sense of a mathematical formula and one certainly has no ethical right to burn other people because they don’t believe in your ‘truth’. You mention the way that Platonism merged to some extent with Christianity. As an example you mention that Plato’s elitism (insisting as he did that only a chosen intellectual few could ascertain the truth and it was their duty to enlighten the lesser orders) is a bit like the structure of the Catholic Church. Yes, I say that Plato provided the intellectual backbone of Christian theology. Yet Plato might talk of absolute truths that exist on another plane but , as works like “The Republic” and “The Laws” show, in the end these had to be enforced by an elite who claimed to understand them. This provided an unhealthy precedent for Christianity. The debate about the Trinity was snuffed out before the inconsistencies in the arguments were ironed out. Did this have a knock on effect? It seems like you suggest that the faculty of Reason for pagans was a tool with which to uncover truth but for Christians truth became something that was beyond reason, making intellectual activity basically futile. Is this a fair summary? In the Catholic catechism the doctrine of the Trinity is described as ‘beyond reason, a revelation of God’. In “Closing” I give lots of quotations by church fathers who say that one should reject reasoning and leave one’s mind open ‘for the reception of the divine word”. I would also argue that if one subjected the Trinity to reason everyone knew that the debate would get nowhere. Thomas Aquinas who brought back reason into theology had to accept that doctrines like the Trinity were matters of faith beyond reason. Were you courting criticism when you called one chapter “Swansong of Free Speech”? Not deliberately – it seems an accurate summing up of what happened. When were Christians as able to discuss theological matters as freely again as they did between 330-381 without fear of being declared heretical?? Probably , and then only tentatively, in the eighteenth century. I notice that you use what are ostensibly modern concepts like “free speech” and “authoritarianism” in the case of St Augustine. Are some readers reacting badly to this tarring of ancient characters with a modern brush, giving the impression you have an axe to grind about the Church? Is it fair to impose concepts from a different era on Antiquity? Well, there was more freedom to discuss issues, even within the church, before Augustine and you do notice how as he gets older he becomes more authoritarian e.g. in the development of his views on the right to persecute. Theodosius’ laws against paganism (in the 390s) are highly authoritarian –it is hard to know what else to call them. Maybe ‘dictatorial’ to use a word used by the Romans themselves!. Have some other historians reacted badly to your books? If so, why exactly are they critical? If you look at the reviews of my books on Amazon.com you will find that the general reader is usually very positive about my work. Virtually all the hostility to my work has come from Christians. I am not aware of mainstream historians who have been hostile to it –other than one secular blogger who seems obsessed about “Closing” but refuses to read my later work. You highlight a strange phenomenon regarding Jesus, as he started out being considered a rebel against the Roman Empire, a sort of Che Guevara revolutionary, but within a short space of time he became the fulcrum of imperial orthodoxy? How did that happen? As soon as the church was tied into the hierarchy of the empire and given tolerance by Constantine, you had a major problem with how to present Jesus. Could an ex-governor-convert like Ambrose actually be seen to be worshipping a man executed by the empire as a traitor? It is all part of the process by which Jesus is elevated into the godhead. I quote Ambrose’s extraordinary assertion that Christ is ‘the leader of the legions’ and there are portrayals of Jesus in legionary kit. This ties in with my earlier point about Christ being shifted to meet the needs of different eras. You suggest that the Church even from its early days was very varied – on the one hand full of ascetics hiding out in the desert and on the other the Bishops of Rome living the high life with power and money. Yes, once the bishops had access to tax exemptions and were given enormous grants by emperors and others, the temptation was to live it up (in a tradition that lasted with the popes in Rome until the eighteenth century when the money began to run out !) Many Christians, like the ascetic Jerome, were appalled by this and it might even be said that asceticism was a reaction to the worldliness of some bishops. Constantine is given credit for establishing Christianity as the religion of Empire but you mention that he appeared ambivalent about the whole business and far from fanatical. It was Theodosius who took the truly major step, is that right? It seems that by the 4th century the Christian bishops wielded significant power and they could put significant pressure on emperors, a mixture of moral-suasion and blackmail. They had become a sort of civil service of the Empire. Yes, and they were used as such, in many different ways including as judges , distributors of poor relief, etc. They also had the money to give out patronage in buildings, etc. – church buildings were the largest projects of the fifth century by far. You point the finger at St Augustine to some extent accusing him of putting the nail in the coffin of the European intellectual tradition when he defined Reason as “sinful curiosity” and gave the stamp of approval for an authoritarian approach to consolidating Church power. Augustine had a brilliant mind but it narrowed as he got older and he drifted away from accepting the importance of reason as he had done in his youth. See, for instance, how he is suspicious of miracles when he is younger but enthusiastic when he is older. As a historian you may feel piqued that official Christian historians cheapened the coin of history . You mention that classical historians like Thucydides and Tacitus had no truck with divine intervention in human affairs but that Christian historians were more than happy to interpret events and give them a Christian “spin”. Well if you write history as if it was the unfolding of God’s will (e.g. that the Temple in Jerusalem was sacked by the Romans in AD 70 as a punishment of the Jews’ treatment of Christ) then you will present a biased and inadequate picture. You will downplay human activity and responsibility and you will tend to see miracles when there were secular causes. You notice the difference as soon as the Renaissance brings back classical models of history writing. .
Is it true to say that under Theodosius, Christian extremists held sway and were in positions of power, that the moderate wing had been elbowed out? Probably this is too crude a dichotomy. What I tried to show in AD 381 was that there was a wide spectrum of opinion. Once one faction, the Nicene , had been favoured by Theodosius: it was impossible for the other theologians to from a unity against them – mainly, of course, because theological uniformity is an impossible dream. You mention that there was also a Liberal tradition in the early Church, Origen for example. Your books seem like the perfect argument for Thomas Jefferson’s separation of Church and State. Yes, Jefferson was right. There is a fascinating medieval treatise by Marsilio of Padua (Defensor Pacis, 1324) who argued for this. It was declared heretical, of course! Just to be Devil’s Advocate for a moment, your books might give the impression that western civilisation took a wrong turn in 381AD and only found its way back on to the right road with Voltaire? I would not want to overemphasize my case as intellectual life might well have stagnated for other reasons and would certainly have been diminished in the impoverished west after the fall of the empire. At the moment I am doing the background reading on the reasons why intellectual life opened up again, notably with the rediscovery of the classical texts in the fifteenth century. There was a whole host of events, the rediscovery of the classical alternatives, the invention of printing (for the first time stable texts that could be easily disseminated), the discovery of the New World , the Reformation breaking up the theological hegemony of the Catholic Church, Spinoza, eventually the Enlightenment, which was, of course, a very complex movement or set of movements ( see Jonathan Israel on The Radical Enlightenment). Do you see the great mistake as being not Christianity per se but the fact that Christianity was so thoroughly politicised. The problem with Christianity all along is its exclusivity. This may have helped at some times but from day one Christians were told to reject major aspects of mainstream society. In the medieval era, for instance, the Christian ideal (notably the ideal of the monk and celibacy) was worlds apart from what is normal living. There is a good chapter in John Casey’s recent After Lives, in which he shows how the Egyptians had an ethical system that rewarded good behaviour but tied that behaviour to what was realistically attainable. Christianity went off the rails here, especially with original sin. So there is more of a problem that just politicisation – though that did not help. Do you see any modern counterparts to this situation, Iran or the USA for example? It is hard to show the extent religion plays a part in politics in any specific example. In the USA the actual political influence of the religious right has been much more limited than many expected it would be. There are clearly cases like the Iranian Revolution where it has been an important force and I would certainly see this as the area which follows most from the fourth century example. However, populist religion seems to play more part here than it did in 381. It is easy to see similarities between the early Church fathers and some of the more obscurantist and fundamentalist mullahs of today and indeed some Evangelical preachers. Are you making a point about this? Religious impulses are very complex. If you believe that God is communicating with you directly, you can become very dangerous if you can tie that into a wider movement. The ascetics did begin to live in a mental world that was divorced from this one, precisely because they needed so little of its material support. In the third book I wanted to speak about, “The New History of Early Christianity”, how did the idea for this book come about? Well, it was direct proposal by Yale who had been keen on “Closing”. I was reluctant to begin with as I felt I had done enough on fourth century Christianity and the first century is enormously difficult for a historian to deal with. Yet they also offered me a contract to write the Relics book I wanted to write, so I took the plunge. I ended up pleased with the opportunity to link the first century with the later centuries as very few histories do this. I also felt that after a great deal of writing and rewriting I got an approach to the first century that made some kind of sense. As expected I have been sniped at some by critics – it’s an academic area where lots of people feel that their approach is the only one. I imagine there are many books looking at this period of time and this subject. Where do you stand in the long tradition of Early Church histories? You specifically call yours “new”. I felt that a number of issues had become overlooked for the first century. You need to make clear that Paul’s letters are the earliest texts. You also need to make clear that he might not have been nearly so successful as he was later made out to be. Increasingly I wonder (and more so since the book was published) whether the resurrection was such a defining event for Christianity as we tend to see it now. I wanted to stress how late the gospels were – they are essentially second generation Christians reflecting on Jesus. I also wanted to make the point that the New Testament is not a coherent body of documents – many texts were only added much later and some interesting texts were discarded e.g. what happened to the memories of Jesus by Peter that Papias records as having been written. I also regard my material on the fourth century as new as it has not been incorporated into the standard histories. You state quite clearly that you are not looking for certainties quite simply because there aren’t any? Is this in itself a novel approach to the subject? Well, it is certainly a distinctive approach. I have toyed with writing a whole book on the impossibility of doing theology . It would probably get lost in the mass of books but it is an important issue. I often find the language of theology totally incomprehensible – this is a worrying sign because if theologians were clear on what they wanted to say they would have been able to write it in comprehensible English – Jesus was onto something with the parables! I also get annoyed with the way some theologians say that history or science or whatever, backs them when the way they use these disciplines would not be recognised. I get the feeling that theology has isolated itself as an intellectual discipline. You describe a key moment in Church history when Christ’s teaching spread to the Gentiles and stopped being a marginal Jewish cult or sect. However, the Gentiles and Jews were wary of the whole business, the Gentiles resisting circumcision and dietary laws and the Jews unwilling to eat with Gentiles. The spread of Christianity outside its Jewish base in its earliest days is difficult to trace. Paul cannot have been solely responsible as many Christian communities were founded in regions he never visited, while some of those to whom he wrote letters do not seem to have survived. Increasingly I am interested in the idea, for which there is quite a lot of evidence, that by eating the body and blood of Christ one could transform one’s own body into the spiritual state needed for the resurrection. One could make the transition from physical to spiritual early by your commitment to Christ. I think this would have given the early Christian communities the psychological boost that would have allowed them to survive and spread. I don’t think that stories of Jesus being seen alive after the crucifixion were as important as Christians believe nowadays. Even in the gospels you have the story that Jesus was believed to be John the Baptist resurrected. In “Christianity”, I go so far to say that it would have been unusual if there had not been similar stories associated with Jesus. I don’t understand the assertion that the resurrection was a unique ‘event’ – such stories were popular and, naturally, hoped for, but that doesn’t mean that they have a basis in fact. The fact that stories about Jesus being seen alive did not persist for more than few days and were ended by another miraculous solution, the ascension, also goes against their authenticity. You describe the early church as a very fluid association of local interpretations of Christianity. Was the founding of a centralised clerical power an attempt to bring a very disparate religion into one fold? The Christians borrowed ideas such as elders and overseers ( the original meaning of episkopos, bishop) from the Jews. The rise of the authority of the bishops is clear from the second century onwards. The difficulty lies in talking of a unified church. The sources suggest continuous debate on key Christian issues e.g. Marcion’s belief that the Old Testament was now no longer relevant, the relationship between Christians and pagan philosophy, etc, etc. I detail these in my New History. One must also remember that the Mediterranean was not suitable for a united organisation – there was simply too wide a geographical spread, there were lots of different cultures and any form of unity would have been unlikely. Of course, some Christians such as Irenaeus in the late second century, claimed a unified church but the evidence for it is limited in comparison to the mass of texts describing disunity. The church had no effective means of achieving unity as one sees from reports of the early councils. Only an outsider with real power – Theodosius – was able to do this. What are your future plans? Do you have another book on the way? I have almost finished a book on medieval relic cults ( Yale, Spring 2011). 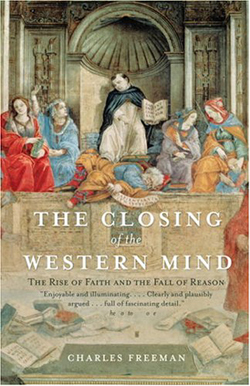 It is an important sequel to “Closing” in that it shows how widespread the miraculous became in Europe after the decline of the Greek rational tradition. There was no serious intellectual challenge to relic cults nor even to the idea of the miraculous until the fifteenth and sixteenth centuries. 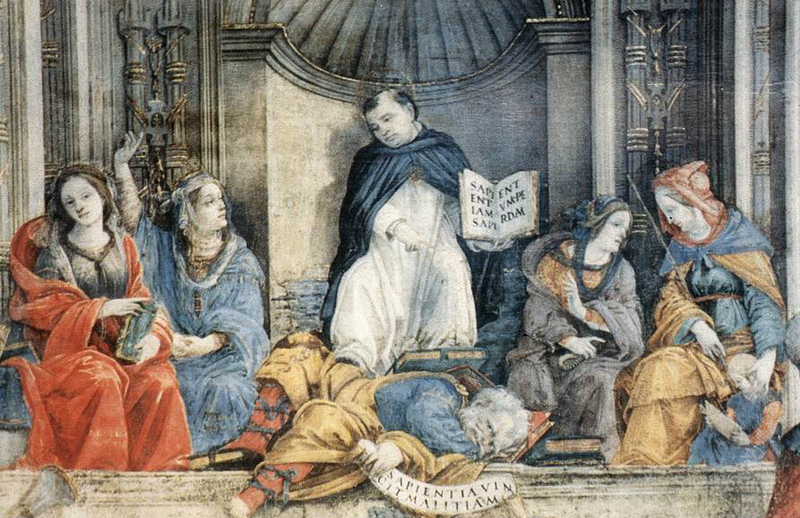 Virtually everyone believed that the remains of a saint or a relic of the passion and Crucifixion was a possible means of getting a cure or communicating through a saint to God/Christ in the hope of getting salvation. The fear of eternal punishment corroded the medieval world. I can never understand those apologists who argue that the medieval church gave dignity to human beings. From popes down it drew on Augustine to repeatedly argue that human beings were vile and servile in the eyes of God and thoroughly deserving of eternal punishment unless for some mysterious reason God chose to save them. My study of relic cults and the intense emotions that the display of relics aroused show just how corrosive this idea – for which, of course, there is no empirical evidence – was. Among study tours – Tuscany , Classical Turkey and a possible book on Renaissance Rome (in the same series as my Blue Guide to Sites of Antiquity), I am planning a big book which will explore the Greek intellectual tradition in greater details than I did in “Closing”, summarise the arguments from “Closing” ,”AD 381″ and “Relics” and then look at how the straitjackets of theological thinking were gradually dismantled between 1450 and 1800. I have the two massive volumes of Jonathan Israel’s acclaimed “Enlightenment” on my reading list!